Finger Lakes Community College has several options for Pathways into a Career in Healthcare! Click below for more information on a specific program or search through our current open courses! Please Note: An orientation session is required for entry into the following programs: Certified Nurse Assistant, Home Health Aide and Licensed Practical Nurse. Please sign up for the next available orientation session! Join one of the fastest growing professions in the healthcare industry! 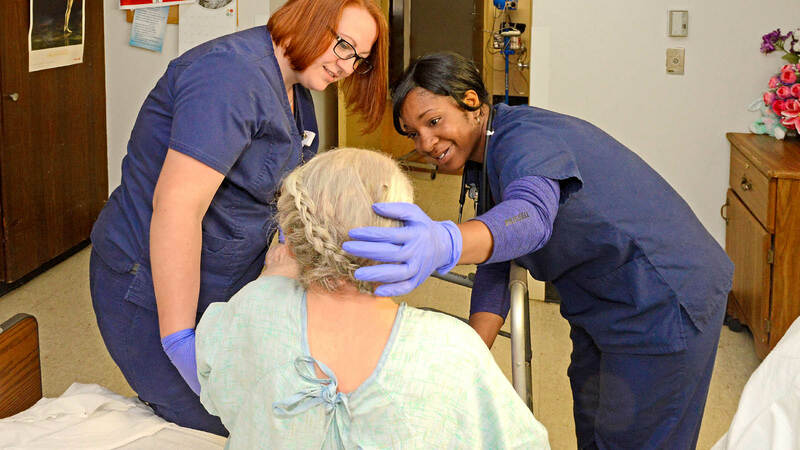 This New York State approved course includes clinical and classroom instruction in patient care, and will prepare you for Nurse Assistant certification. Students will learn: Patient care (clinical and classroom), Patient safety, Infection control procedures, Moving, feeding and caring for patients, Nutrition and diet therapy, Assisting with admissions and exams, Communication with the patient, Patient self care, Pre and postoperative care, Anatomy and physiology, Circulation and respiratory care, Elimination procedures, Human sexuality, Job seeking and retention skills. All Certified Nurse Assistant Training Sessions require attendance at a free 3-hour orientation prior to acceptance into the class. Select the green Orientation button above to register for the next CNA Orientation Session near you. For the full class found here, the start date shown is the first day of class. This class exceeds NYS standards for CNA training. It typically runs 5 weeks, but can run from 4 to 6 weeks depending on the specific class. The first portion, approximately three weeks, is classroom training and skills practice. After that you will participate in clinical practice on-site. After your clinical experience you will take the NYS Certification exam. Upon completion of the class and passing of your exam you will be a NYS Certified CNA! Detailed information on the schedule will be provided at your orientation session.